Cosmetic acupuncture is a totally natural facial treatment that can significantly improve the tone, texture and appearance of your face. Cosmetic acupuncture can have the same results as more invasive surgical procedures such as fillers, injections and chemical treatments but without any of the nasty side-effects or uncertainties. Results can be remarkably quick and studies published in the International Journal of clinical Acupuncture have shown that 90% of patients showed marked results after only one treatment. Cosmetic facial acupuncture can significantly improve the appearance of fine lines, wrinkles laughter lines crows feet and forehead borrows in a completely natural way. The skin around the face and neck will look smoother and more radiant and you will feel more balanced and happy within yourself. Improving blood flow to encourage detox and lymph drainage. Stimulates the natural collagen fibres in the skin to tone and repair skin. Tightens the skin around the face and neck. Improves skin appearance in conditions such as acne and menopause by regulating hormones. Reduce swelling, puffiness and bags around the eyes. Book now for a cosmetic facial acupuncture treatment and see and feel the difference it can make in a totally natural way! 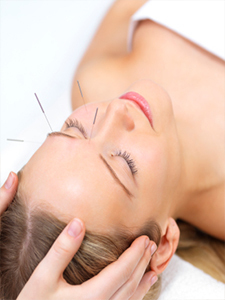 Facial Cosmetic Acupuncture – £75 per session or prepay for 5 treatments and receive 1 treatment free.